Um…Happy Little New Year? Sorry! Stuff happens, comme on dit. I’m sorry for not being on time with this, but in case you haven’t found another as stupendously useful as this one, here’s my 2014 calendar, in 12-page 11×17 PDF format, that you can take down to the printer and have up on your wall in a jiffy. For details (and lots of them! ), see my posts from previous years. I’ve already started the 2015 one, hoping that that will make it easier to get it posted in time. Sheesh. 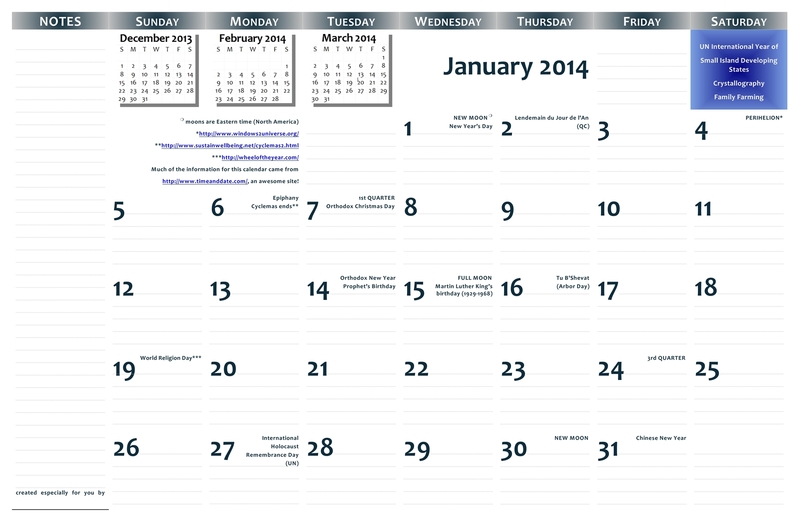 First image is a JPG preview of January, second (link at the bottom) is the full PDF. Enjoy! Yay I thought you disappeared! Thank you so much.. send me a message when you post 15! I’m so glad you’re finding it useful, Trish. I do promise to let you know when I post the 2015 one — I was considering doing so with this one, but you beat me to the punch! 🙂 All the best for this year and always!